At last the long summer break was over and we headed for Shakespeare County Raceway, the weather forecast was outstanding for the 3 day event and in fact the weather was the best we have seen for years in the UK for Drag Racing with clear Blue skies and the temperature reached 91 degrees F on Monday. Brad has been the Super Pro Champion for the last 2 years running in the APIRA championship and we were hoping to make it 3 in a row. Brad is having a good year, 2nd in the UK National Championship, 2nd in the Santa Pod Racers Championship and 3rd in the APIRA Championship. 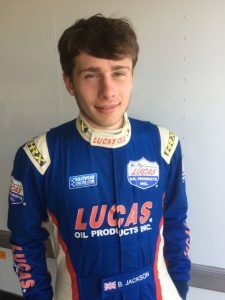 In the 1st round of qualifications Brad got a lot of wheel spin of the line and put him in a lowly 8th place , in the 2nd round Brad ran a 7.784 on a 7.78 dial, this time of 4 thousands of a second over dial put Brad in 2nd place, this was a very good time and we would be unlikely to improve on 4 thousands of a second over dial in. This turned out to be correct and over the next 5 qualifying sessions Brad couldn’t improve this time, 2 other drivers did though leaving Brad in 4th place when qualifying was finished. 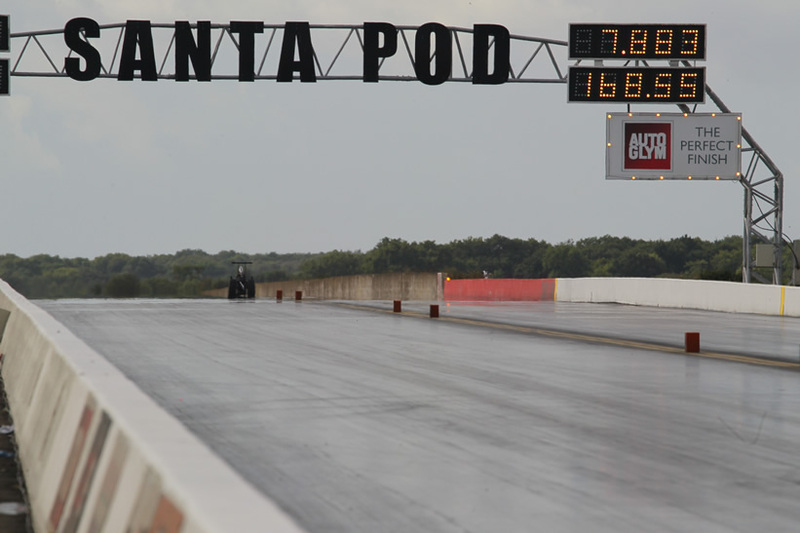 The first 5 times are below showing how tight and competitive Drag Racing is. Monday brought the hottest day with the weather station peaking at 91 degrees Fahrenheit, in round 1 Brad was drawn against Ian Brown, Ian has a new car which the crew have been working hard to get the car consistent since the back end of last season, however at this event they were really on form and had set a new personal best in qualifying. When the lights went down Brad had an uncharacteristic poor light of 0.14239 ( 1.4 tenths of a second ) and Ian pulled a 0.06762 ( 6 hundredths ) and the race was already over, Brad never caught Ian with this deficit, although he almost caught Ian at the line just losing the race by 0.01993. This was a serious blow to Brad’s championship hopes, the Shakespeare championship (APIRA) was now lost, however good fortune did help Brad, Scott Hauser red lit, Brian Pateman red lit and Chris Parker lost his race, this meant the first 4 in the UK championship had lost , so this was a good result from a bad position. 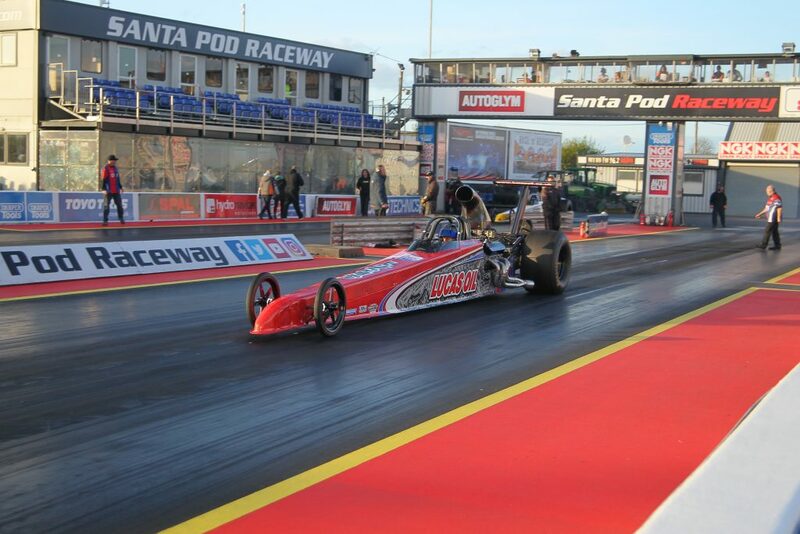 With 2 meetings left in the UK Championship the result of the European finals meeting at Santa Pod next week will be crucial, look out on bradjacksonracing.com for live updates on Twitter and Facebook with live updates on the home page from Thursday 7th September. The long summer break is over, we have 3 rounds left in the UK Championship; it’s a close championship this year with Scott Hauser leading the way on 1880 points, Brad is in 2nd place on 1850 points , John Pryzbyl on 1670 points, Brian Pateman on 1420 and Brad’s stable mate and last year’s champion Chris Parker on 1380. 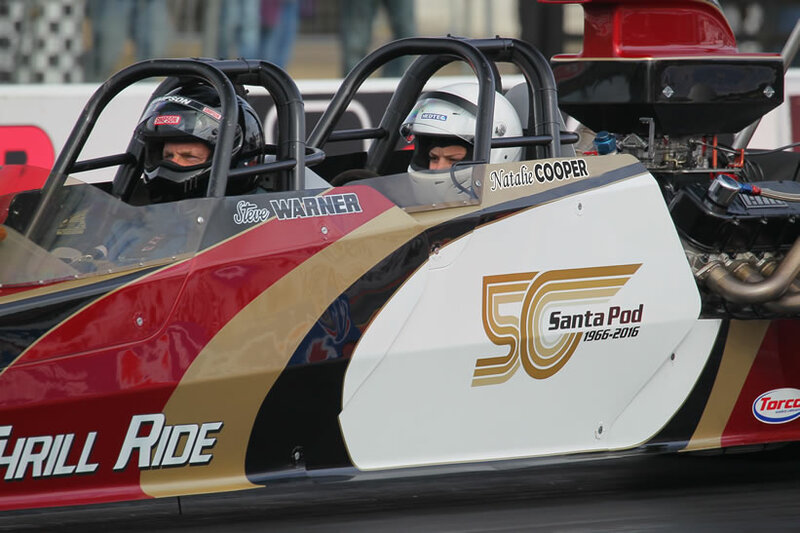 There is a 100 points available for every round win so it will be an exciting end to this year’s championship and Wayne predicts a last round nail biter at the National Finals at Santa Pod at the end of September. 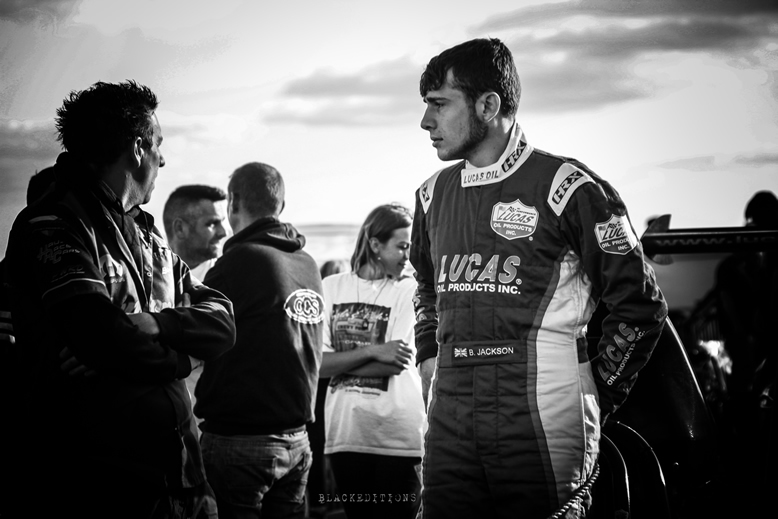 This weekend brings the Open Sports Nationals at Shakespeare County Raceway at Stratford upon Avon, Brad has won the Super Pro Championship for the last 2 years running but is currently lying 3rd in this championship behind multiple champion Scott Hauser and last year’s champion Chris Parker, it will be an interesting meeting and will lay the foundations for the rest of the season. 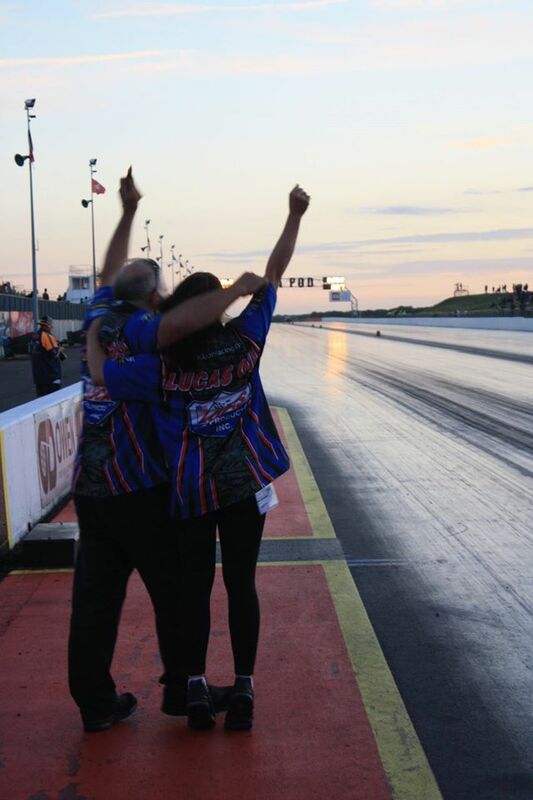 Two weeks after the Open sports Nationals are the European Finals at Santa Pod and Brad will be hoping for a repeat of last year’s win, two weeks after that are the National Finals at Santa Pod so it will be a hectic next 6 weeks but as you are aware Drag Racing produces many twists and turns and unexpected curve balls, this is why we love the sport so much? 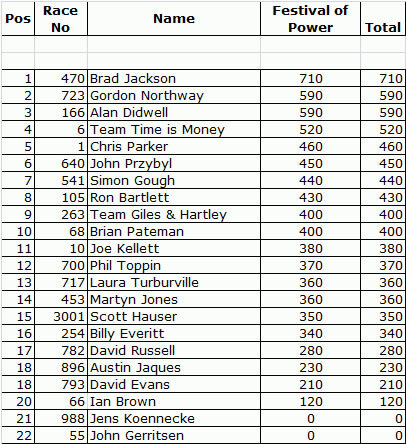 Bradjacksonracing.com will have a live Twitter feed on from Saturday for the 3 day meeting so you can check out his progress. Well that’s it, short and sweet and I will send a newsletter after the event, have a great bank holiday weekend ! 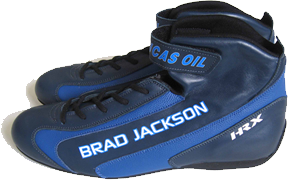 Brad Jackson Racing have teamed up with HRX and Brad will be wearing his new custom suit and custom boots at Shakespeare County Raceway, the suit is a super light triple layer suit as worn in F1 and Le Mans, and the boots are super soft leather custom boots, if you fancy a new suit or boots, pop along to the Super Pro pits and Brad will be happy to show you his new attire. Brad will no longer wear his old suit so I have attached my favourite photo of Brad in the old suit, Black & White photo’s somehow are more evocative than Colour ! We arrived on Thursday to set up for the weekend, we were full of anticipation for a great weekend and with Brad currently leading the UK championship the team were in a buoyant mood. Friday morning was a beautiful sunny day and we went down for our first qualifying run, Wayne dialled a 7.74 based on the previous meetings data at Shakespeare County Raceway, we ran a 7.79 seconds run and this was good enough for 4th place, this got us very firmly into the 32 car field. There were 40 cars from many European countries and 8 teams were going to be disappointed and not make the field, the level of competition was extremely high. 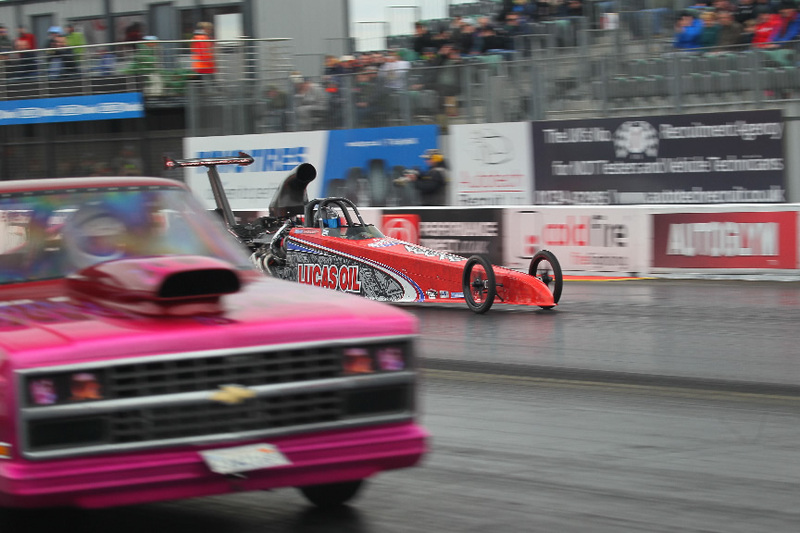 On our second run Wayne dialled a 7.73 but we ran too quickly and broke out on a 7.69 run (fouled). In our first round of Eliminations we met Gordon Northway, Gordon is very competent and this was a tough race, Brad won the race by just 200’ths of a second, this was a great relief to the team because 16 cars were eliminated and we were now in the second round and had recovered the poor qualifying position. In the second round we raced Mick Howling and Brad cut a great light (reaction time ) 0f 0.07 of a second to Mick’s 0.138 reaction and Brad had the upper hand, unfortunately Brad broke out ( fouled ) and our weekend was over. We packed away and stayed the night in the RV before heading home on Monday morning. We woke to find there had been some rain overnight and the weather forecast was poor for the rest of the day, we do not wish to be bad sportsmen but the rain could save our weekend. We drove home continually looking at the event on Eurodragster.com and the Super Pro class didn’t run again, this saved our troublesome weekend because the points accrued at the point of the meeting being abandoned stand. So we came away from a bad weekend only dropping to second spot in the championship 120 points behind Scott Hauser, this could have been a much more damaging weekend and there is a rumour that Wayne’s rain dance help to contribute to the downpour ! We have sent the data from the car to the injection company in the USA and can hopefully resolve the issue before the Summer Nationals at Santa Pod on the 24th-25th June! 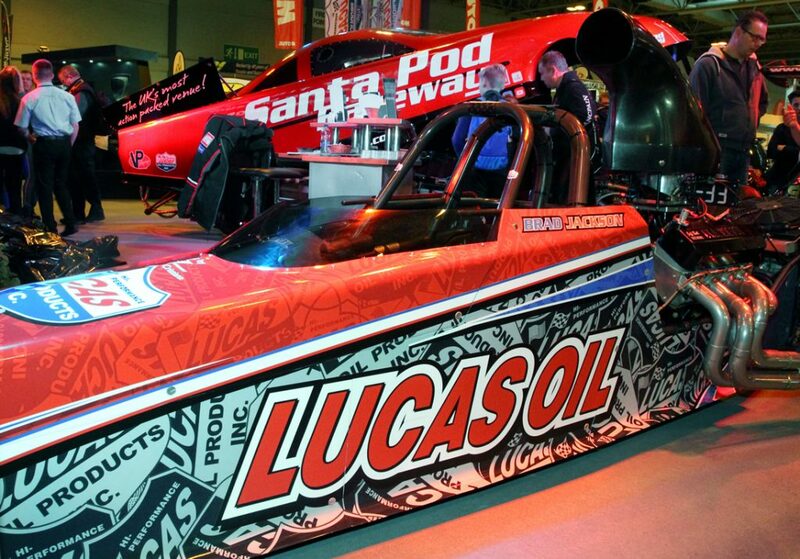 We Head for Santa Pod Today ! ! 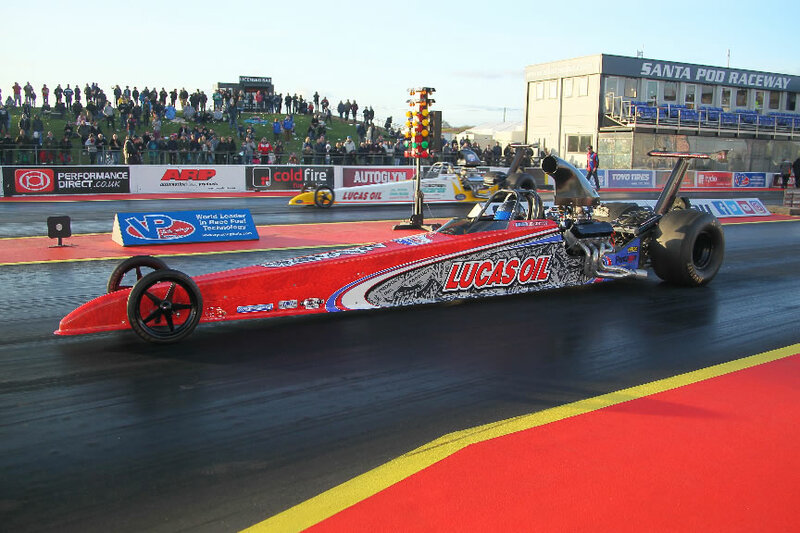 We head to Santa Pod today for the Main Event, this is an FIA event for the European series, Brad currently leads the UK Championship by 220 points and the team are eager to maintain this lead. 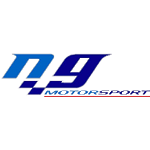 There is an entry of 40 cars that will be qualifying for a 32 car field, with a strong European entry there are drivers from France, Germany, Holland and Switzerland it will be a competitive qualifying with 10 sessions over Friday and Saturday and eliminations on Sunday and Monday. Last year the bump spot was 400 hundredths of a second so the team will have to be on their game just to make the field, there will be 8 disappointed drivers that won’t get into the event? 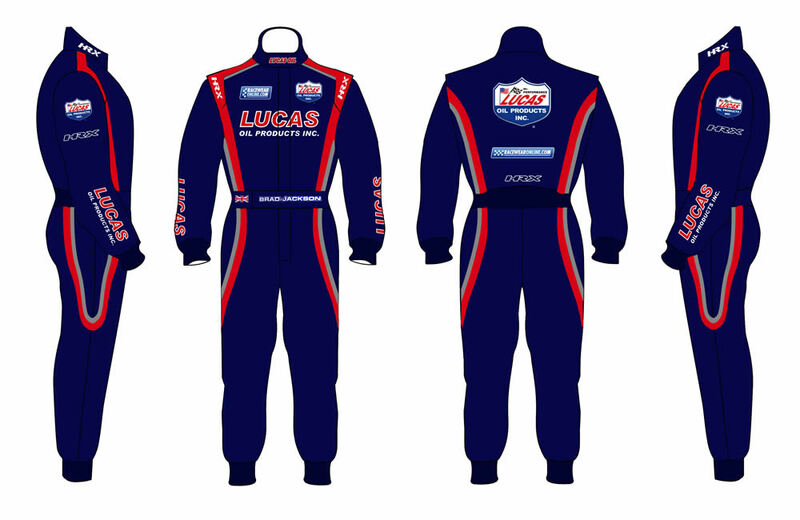 We wish Brad a safe, consistant and fast weekend, a race report will follow after the weekend ! We arrived at the track with a level of anticipation, Brad has been the Apira ( Avon Park International Racing Association ) Super Pro Champion for the last 2 years , a great achievement but we are determined to make it 3 in a row ! The weather forecast was fine for the next 2 day’s but Bank Holiday Monday didn’t look too good so it could be an event where the qualifying points would be crucial. In Q1 Brad got off to a great start with a 0.042 reaction time but Wayne got the dial in slightly wrong and had dialled 7.81 but Brad ran 7.799 and broke out by just over a hundredth of a second. Q2 Brad very nearly got the perfect ET award but red lit by 0.001 ( 1 thousandths of a second ) but Wayne’s dial in was 7.75 and Brad ran 7.77 good enough for No 1 for a while until Chri Parker in the other Nick Good Motorsport car took it at the end of the session. Q3 Brad cut another great light at 0.065 but once again Wayne got it slightly wrong dialling 7.76 and Brad running a 7.755 breakout by 5 thousands of a second, this dropped Brad to 4th. 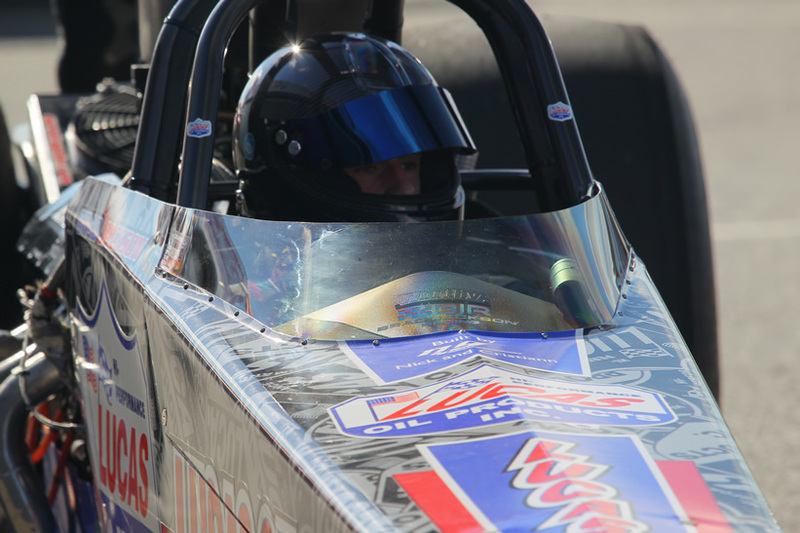 Q4 Brad cut another great light 0.025 reaction time but Wayne’s dial in of 7.75 and running 7.79 didn’t improve our position. Q5 Brad’s reaction was 0.102 but Wayne stuck with the 7.75 because the track appeared to improve but we ran 7.79 again so no improvement. Q6 Wayne was convinced the data showed the car would run a 7.78, Wayne dialled 7.78, Brad cut another great 0.072 light but Chris Parker in the sister car ran 7.80, Wayne changed Brad’s dial to 7.80, big mistake ! the car ran 7.788 which would have put us second to Scott Hauser, however 4th was still a great result especially as this put Brad on the bye run side of the ladder, if Brad won a couple of rounds we would have a bye run into the semi finals, with hindsight ( a great thing ) Wayne tried a little too hard to get the number 1 spot over the event but Wayne knew with the rain coming on Monday the extra points could be valuable in this championship. We woke on Sunday to the predicted rain, this was a real shame, the crew had prepared a great track all weekend and had put on a great event, the rain was only light and stopped, the crew dried the track only for it to rain slightly and spoil the efforts of the track crew, this also happened on a second occasion but the crew continued to battle the weather and eventually they were rewarded with a track we could race on at 4pm. Brad still had his competitive edge beating Wayne 3-2 at connect 4 in the RV ! 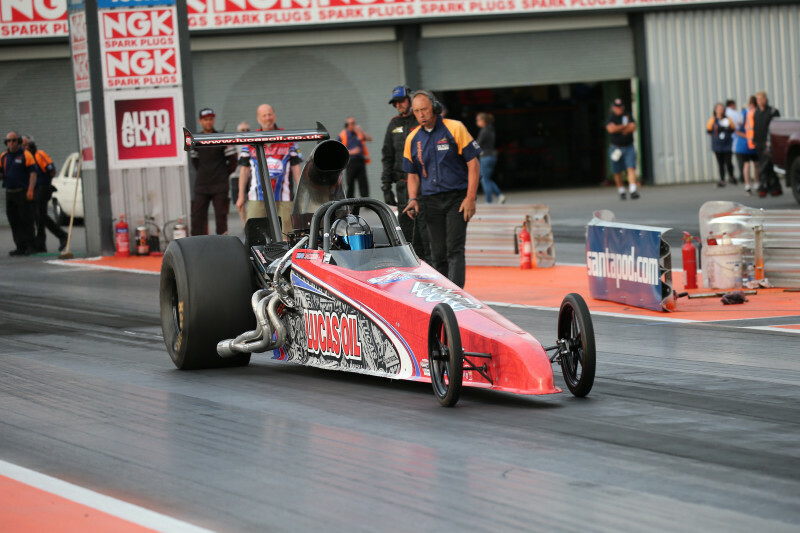 In elimination’s round 1 Brad cut another great 0.075 reaction time to take the win against Ron Bartlett, this unfortunately as far as we got, there is a noise curfew at 5pm on holiday Monday’s and unfortunately time ran out so that was the end of the meeting. 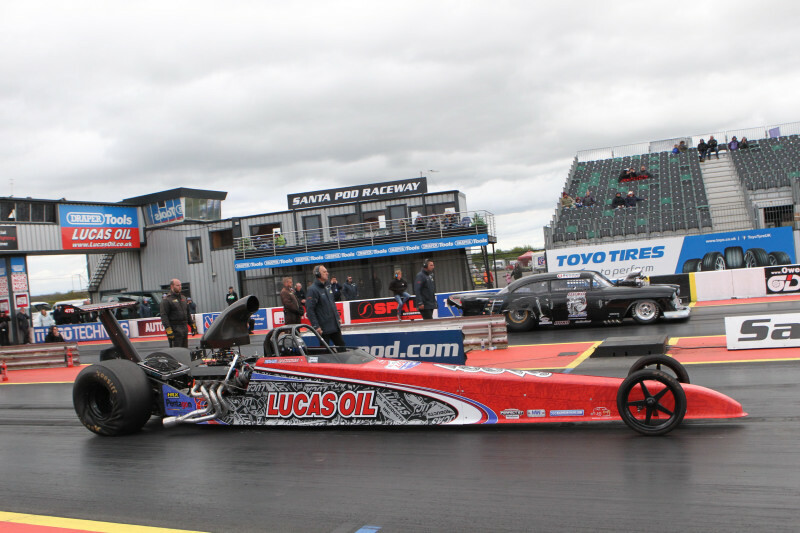 This result means that Brad is still leading the UK championship and we look forward to the next event which is the Main Event at Santa Pod 26th – 29th May, the entry for Brad’s class is currently 40 of the very best Super Pro drivers from various European countries so this will be a great event ! There is a lot of speculation that this could be the last year we race at Shakespeare County Raceway, it looks like a new town with 4000 houses and the full infrastructure are going to be built on this site, this will be a great shame, it is a great venue with a really hard working team, let’s hope the planners do not get there way ! Great Start To The 2017 Season ! Due to work commitments Brad was extremely busy at work so once home from work we headed for Santa Pod and arrived at the track at 1130pm, our fantastic crew and team mates had already prepared the pit area and also built Brad’s car for us, great teamwork thank you ! We rose at 6.15 to prepare the car for scrutineering at 7am and Brad went and signed on, the car passed tech and we went back to our pit to prepare the car for qualifying, we hadn’t had time to test the car prior to the event so we planned a “half pass ” to ensure that everything checked out ok.
Q1 the car launched well but a cold track with poor grip resulted in Brad being 7 tenths of a second off our dial in, other drivers had the same issues and we still ended up in 7th position from 18 cars. 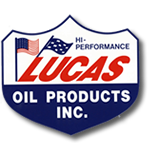 Everything was fine on the car, we just had a little bit of oil going into the catch can, this is normal following and engine rebuild until the piston rings bed in. Q2 saw 21 cars make the field and by the time Brad made his run we had slipped to 13th place, a good solid second run at 1 tenth of a second of dial in saw Brad back in 7th place from the 21 cars that qualified, that was is for today so 2 more runs and the first round of eliminations tomorrow. Q3 didn’t see any improvement so our Q2 time still stood and we now dropped to 11th place, this was not an ideal place meaning if nothing changed we would be facing the No1 qualifier in the first round. Q4 brought another car into the field, Brad’s Nick good Motorsport team mate Chris Parker went to No1 with a time 3 thousandths of a second off his dial in, we had tried a little bit too hard, we dialled a time of 7.83 and ran 7.824 breaking out by 6 thousands of a second leaving Brad in 12th place and facing our team mate Chris Parker in round 1. This is always a difficult situation for the team, we always prepare the cars identically and we also share a huge amount of data between the 2 cars, it was going to be an interesting 1st round, Chris has the No 1 on his car as the reigning Super Pro champion, Brad would need to be at the very top of his game. As you would expect from these 2 high calibre contenders it was a very close race with Brad taking the win by 2 hundredths of a second. Because Brad had beaten the No1 qualifier Brad had a bye run in round 2 so we were pleased to have an easy but well earned bye run. Round 3 of eliminations Brad was drawn against an extremely competitive Gordon Northway who had been running bang on his times all weekend, once again Brad needed a flawless performance if he was to take the win, Brad cut an 0.0414 light to Gordon’s 0.0793 so it was going to be close, Brad ran a 7.862 0n a 7.85 dial in to Gordon’s 8.521 on a 8.51 dial in, giving Brad the victory by 3 hundredths of a second. In the semi final Brad again ran very close to his dial in and beat Alan Didwell to see Brad in the final of the first meeting of the year, facing a strong contender from the Netherlands , John Gerritsen in a brand new 55 Chevy running in the 6 second bracket. In the final Brad cut a great 0.071 light to John’s .165 so Brad had the lead, but with a car almost 2 seconds quicker than Brad’s it would be all on the dial in’s ! 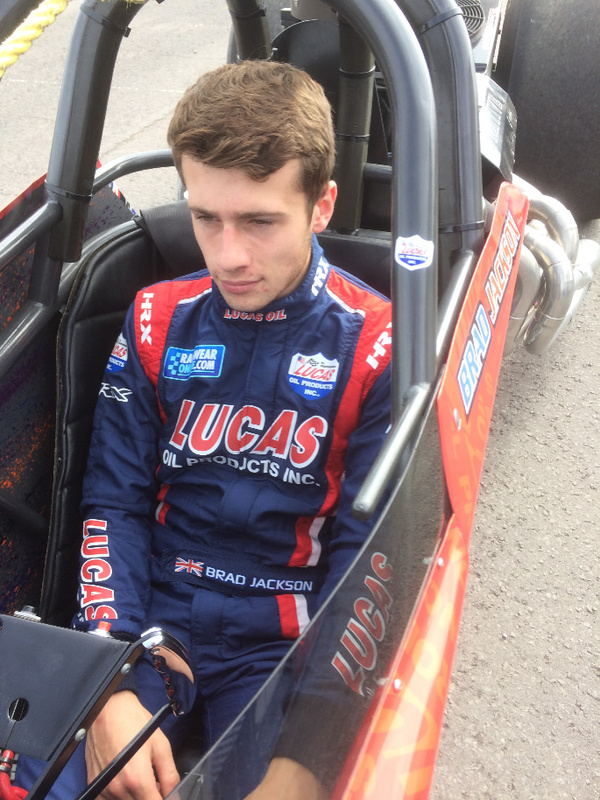 Both car’s broke out but Brad’s was the larger breakout at just over 2 hundredths of a second to John’s 2 thousandths of a second, giving the victory to the Dutchman, his journey back to Holland would be a far happier long drive ! Well done to John and a fantastic job of driving a car that was out of shape, he pulled his parachutes to keep the car straight and kept his foot on the gas to pip Brad at the stripe, great piece of driving and a well deserved victory. We had a great first meeting and bagged a valuable haul of championship points finishing the weekend as the runner up, we do it all again in 2 weeks time at Shakespeare County Raceway where Brad is the current APIRA Super Pro Champion and is looking forward to defend his title, it is also Brad’s 21st Birthday that weekend so let’s hope it will be a very Happy Birthday ! 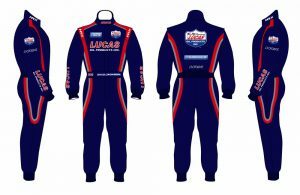 I would like to say a big thank you to all our sponsors, Lucas Oil both in the UK and the USA, Pentagon Corporate Fleet, D & S signs, Martin Williams Hull, HRX ,Racewearonline, our associates Pete Walters race design last but not least Six B Apparel in the USA. 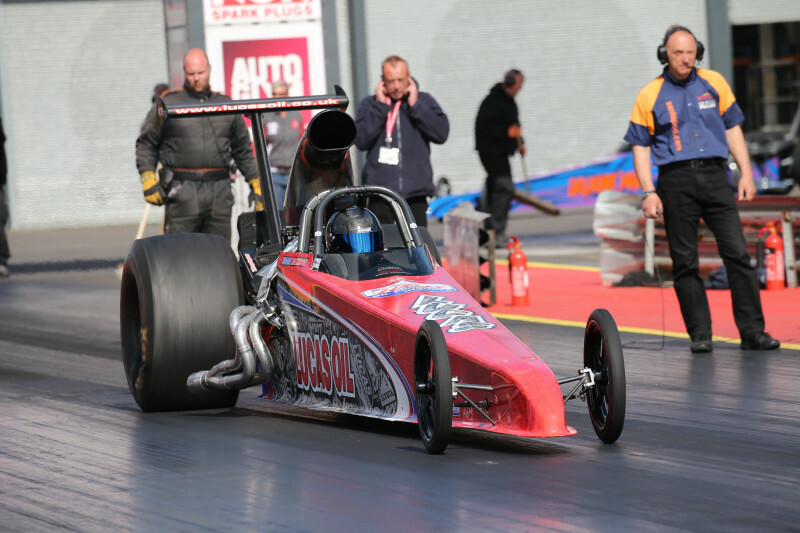 Some of the Images used with the kind permission of the original photographer tog@Eurodragster.com unless stated, Thank you. A Fantastic Winning Year ! A little disappointed, but a fantastic winning year ! 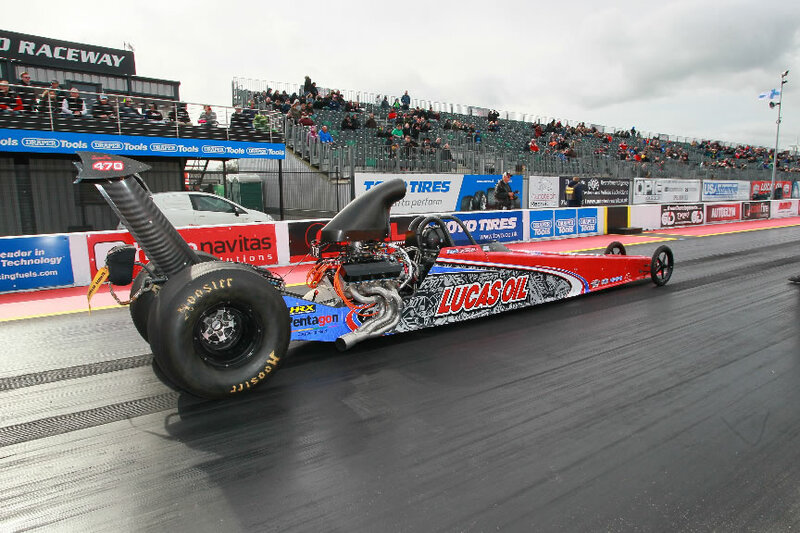 We arrived at Santa Pod on Friday and set up the pit and awning, we scrutineerd the car and then had a relaxing time before the event started with 3 qualifying runs on Saturday. The UK Championship was very close with any one of the first 5 competitors in with a chance of taking the UK National Championship crown; Brad was lying in 2nd place and we were hopeful of a great event. The first round I dialled a 7.76 and Brad ran a 7.80, 4 hundredths of a second off the dial in, this time placed Brad in 5th position so was a great start to the day. The second round I dialled a 7.79 and Brad ran a 7.82, 3 hundredths of a second off the dial in, although this was a slight improvement due to the others improving this dropped us to 7th. The third and final qualifier was crucial especially for the qualifying points, I dialled a 7.81 to try and get us nearer the top. Brad came round and did a burnout, I felt the sun had been on the track and my instinct told me we were going to run quicker so just before I took Brad to the line I changed our dial in to 7.79, Brad ran 7.795 a great result, 5 thousandths of a second over the dial in put us in 3rd place. 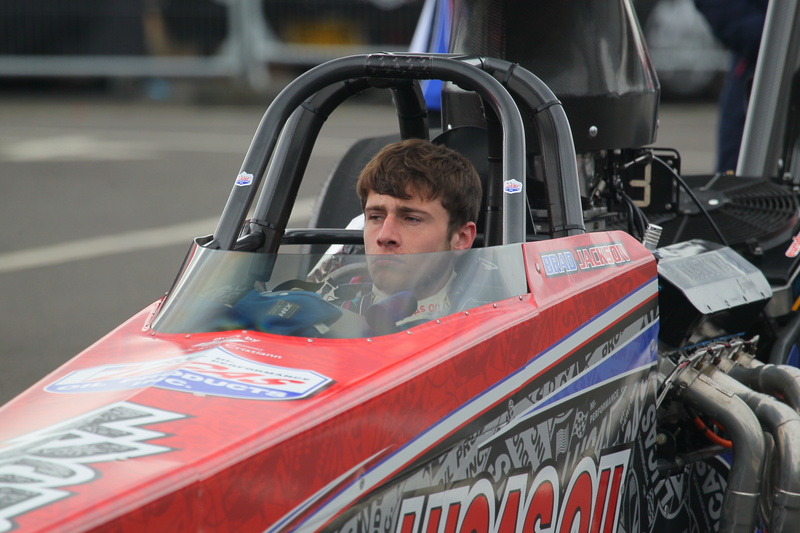 The car and Brad were performing well so we looked forward to the eliminations on Sunday morning. Sunday morning brought a little rain shower so the start was delayed by about an hour. The first round of eliminations made interesting reading, Billy Gane (No 1 in the championship ) against Scott Hauser (No 3 in the championship) and Brad ( No 2 in the championship ) against Ian Powell ( no 4 in the championship) if you were a betting man then you would have got some very long odds against that happening ! Chris Parker (No 5 in the championship) had a bye run due to being No1 qualifier. Scott beat Billy and Ian beat Brad, this now meant that Scott only had to go 2 rounds of eliminations to be champion for the 3rd time. 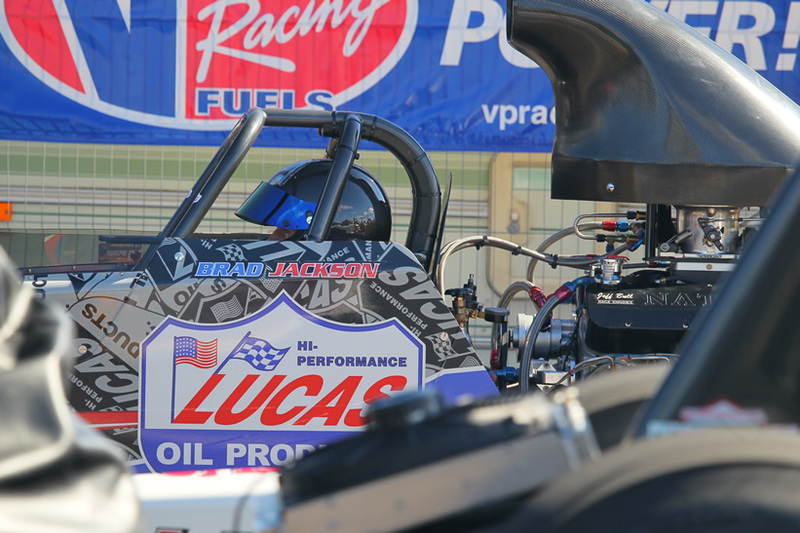 Ian Powell dialled 8.13 and ran 8.131, with a reaction time of 0.04 was a clear winner, it is a little strange when we talk in these numbers that Brad’s package was 0.0241, 2 hundredths of a second off our prediction and Ian’s package was 0.0017, 17 thousandths of a second of his prediction that we say Ian had an easy win by 0.1465 of a second. Scott, Ian and Chris all went through the next round so one more round and Scott would be champion, in the next round Scott unfortunately broke out by 5 thousandths of a second so now the first 3 coming into the event had all been eliminated ! Natalie was treated by Nick and Wayne to a passenger ride in the 2 seated dragster, her ride resulted in a run of 7.88 seconds at 168 mph, Natalie now has the bug and would like to drive a dragster! We would like to thank all of our sponsors and supporters for their help, Bradjacksonracing.com couldn’t have had this level of success in the hardest class in Europe without your help! 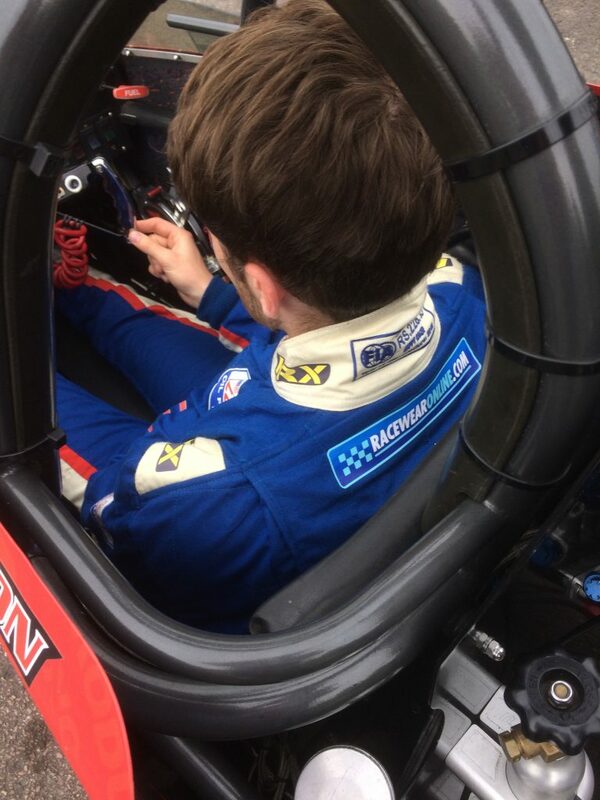 Well Done Nick Good Motorsport! Ian and Chris both went all the way and met in the final, the maths were simple, win the meeting, win the UK Championship, who would it be? The winner was Chris Parker! Ian unfortunately red lit and cost himself a chance of the being the champion! 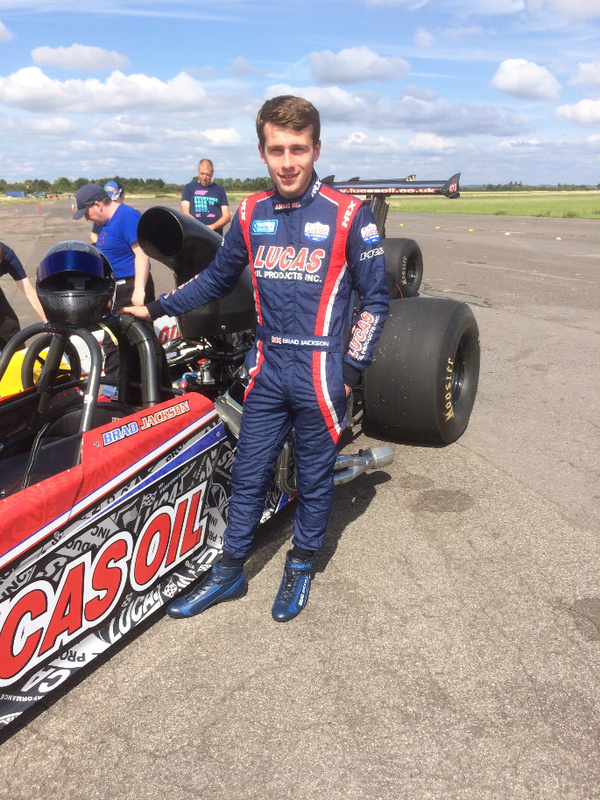 Congratulations to Chris on taking the championship, Chris drives another of our teams dragsters so well done Nick good Motorsport! We would like to thank our wonderful crew, Nick Good, Christiann Carlo, Natalie Cooper and of course Alison, Brad’s mum, who has kept us all wonderfully fed throughout the season! 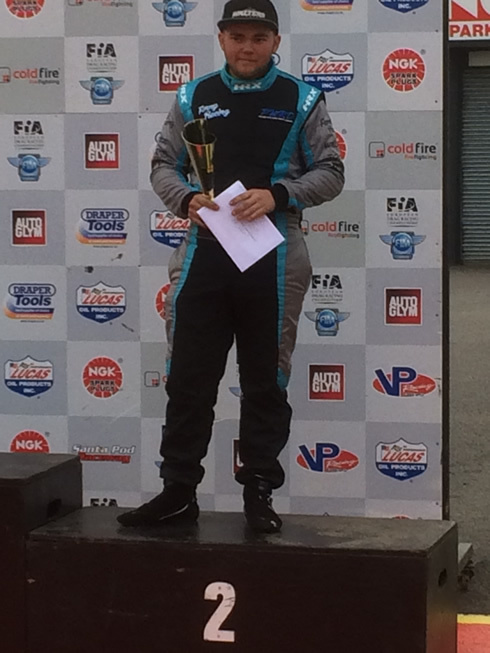 Although we feel a little disappointed today we gave it a really good shot and Brad has had a fantastic year winning the Open Sports Nationals and retaining his APIRA Super Pro Championship title for the second year in a row. 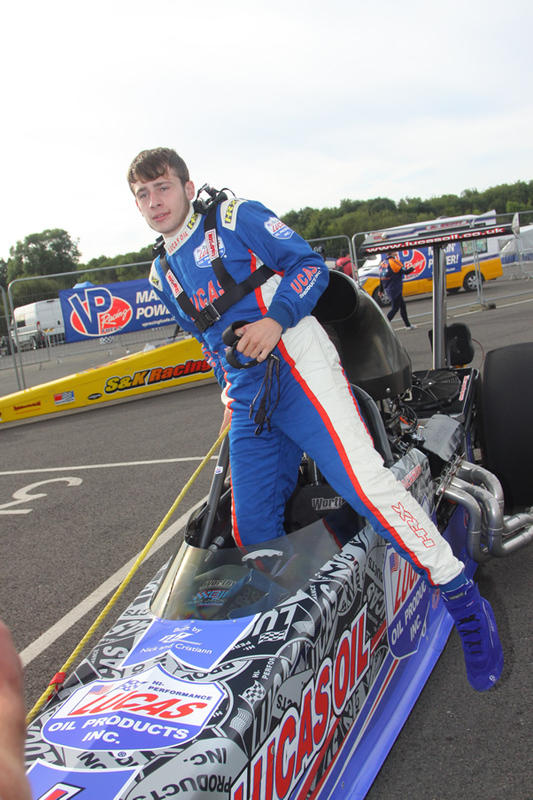 He also won the FIA European Finals meeting at Santa Pod, this is the highlight of the year for Brad, he had been runner up in this event in his junior dragster in 2010 when he was just 14 and red lit, so he has always wanted to win this event and lay that ghost to rest ! 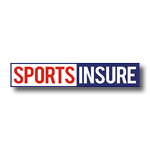 We are already planning our assault on the championship in 2017 and we will be presenting the car in a new livery at the Autosport International Motor Show in January so why not drop by and say hello? Brad collecting his trophy at the Santa Pod Racers Club awards evening. 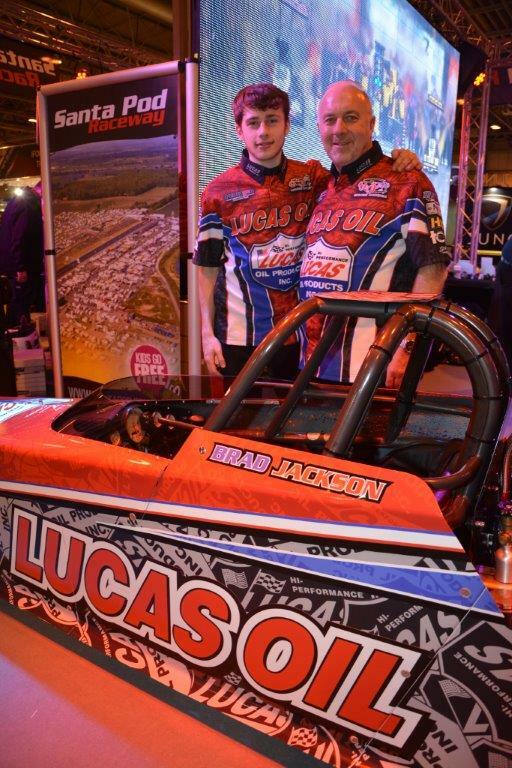 Brad won both the Super Pro UK National Championship and the Santa Pod Racers Club Super Pro Championship.